The USDA recently released the latest estimates of sector-level net farm income. These data provide an overall measure of the economic and financial conditions of the agricultural sector. The latest forecast revealed a much higher forecast of net farm income than previously estimated. Those who regularly monitor these data – as Brent and I do – were surprised by the large, upward adjustment to sector income. This week we take a look at the latest data, the adjustments, and the implications moving forward. In figure 1, the USDA’s August estimate for real (inflation-adjusted) net farm income is shown. The current estimate has 2016 income at $64.3 billion. This represented a 12% drop from 2015 levels and a 44% drop the record-levels observed in 2013. When considering the long-run, 2016 real net farm income is currently forecast slightly below the 88-year average of $71.8 billion (shown in orange). Furthermore, the current 2016 estimate is at levels not at all uncommon. 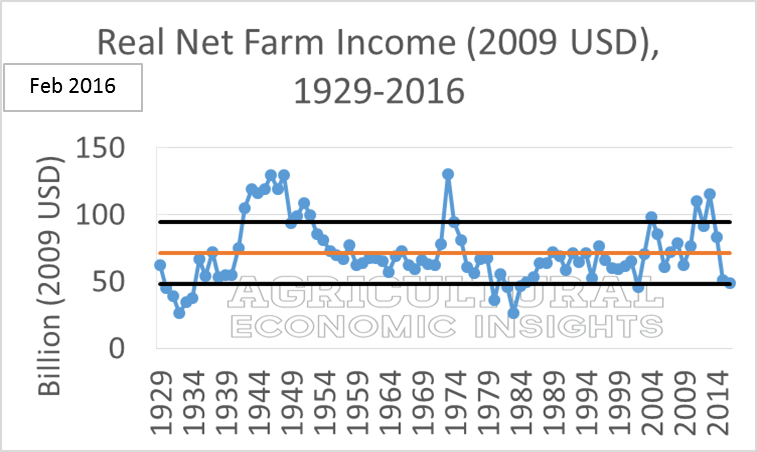 Since 1990 net farm income has been lower than 2016 levels 30% of the time (8 out of 27 years). Figure 1. USDA Estimated Real Net Farm Income, 1929-2016 (2009=100). Data Source: USDA ERS, August 2016. As mentioned earlier, the USDA’s previous estimates of 2015 and 2016 sector income were quite different. In figure 2 the data from the USDA’s February 2016 estimate is shown. Previously, net farm income was estimated well below the long-run average (in orange) and hovered near the lower black line (which represented one standard deviation below the mean). Figure 2. USDA Estimated Real Net Farm Income, 1929-2016 (2009=100). Data Source: USDA ERS, February 2016. To look at the data a bit closer, table 1 shows the February 2016 and August 2016 estimates of net farm income for 2013-2016. For 2015, net farm income was adjusted higher by more than $22 billion, or 43%. For 2016, the adjustment was smaller, nearly $15 billion or 32%, but still large and very significant. Table 1. USDA Forecast Real Net Farm Income ($, billion, 2009=100), 2013-1016. February 2016 and August 2016 Forecasts. So What Caused the Estimate Changes? Any change to income results from changes to revenue and/or expenses. In nominal terms (not adjusted for inflation), the USDA’s latest estimate for 2015 production expenses were $21.5 billion lower. A large chunk of the total expenses adjustment came from capital consumption, which alone was adjusted lower in 2015 by nearly $9 billion (nominal). Changes in capital consumption account for nearly 42% of the total change in 2015 production expenses. In short, higher net farm income estimates were the result of lower production expenses. More broadly, the change in cost of production estimates represents a faster-than-expected adjustment in the overall cost structure. We’ve frequently commented about adjustment in the cost structure being important given the environment of lower commodity prices. Specifically, total sector production expenses in 2015 were initially estimated to be 2% (or $5.6 billion) lower than 2014 levels (February 2016 estimate). The latest estimates, however, have production expenses in 2015 lower by 9%, $32.6 billion. When thinking about farm income, it can be seen as good news that production expenses have softened at an accelerated clip. Looking ahead, the USDA estimates 2016 total sector expenses at 4% lower than 2015 levels, or down $12.8 billion. This means the USDA expects expenses in 2016 to decrease at a slower rate than what happened in 2015. With that said, the 2016 estimates – like the 2015 estimates – might be subject to large future adjustments. The latest USDA estimates of U.S. net farm income illustrate a different environment than previously forecasted. The current estimates have sector conditions near the long-run average, as opposed to approaching levels observed during the farm financial crisis of the 1980s. While much of the attention focused on the changes to the 2016 estimates, the majority of the adjustments occurred with the 2015 estimates with subsequent carry-over into the 2016 estimates. These changes were primarily reflective of lower production costs, especially on capital consumption. There are a lot of ways the latest data can be interrupted. An optimistic view might be relief at the faster-than-expected reduction in production expenses. These estimates, especially when considering capital consumption and expenditure, are often difficult to measure and take time to fully capture. On the other hand, a less optimistic – if not outright cynical – view might be that “things could get a lot worse” when thinking about current realities in comparison to the 1980s. At the end of the day, the USDA’s latest net farm income estimates – and associated adjustments – do not change the financial and economic realities individual producers face. While the sector level conditions are better than previously expected, producers are still facing tough financial conditions.